Lesson 13 – circuits and first solo! We started off the lesson in much the same way as the previous circuit lessons. By now, I’m used to the routine of checking the aircraft, starting up, taxying and flying the circuits. I flew 5 unassisted circuits (there was a 6 knot crosswind) and things seemed to be going well. The sky was a beautiful blue colour, you could see for miles and there wasn’t much traffic in the circuit. After the fifth touch and go, during the downwind leg my instructor said we should land after this one. I thought nothing of it, and carried on with the circuit and landing. We vacated the runway, ATC gave us taxy instructions back to the apron, and then my instructor replied with the immortal words “request crew change, for student first solo” and suddenly my heart started racing. After waiting for – and thinking about – this moment for so long, my head had a mixture of emotions ranging from excitement through to trepidation. We taxyed up to holding point alpha 2, and my instructor gave me a few words of encouragement and advice. When I’m alone in the plane, my callsign would be Student Aeros 51 instead of the usual Aeros 51. I had to say it out loud a few times to myself, just to practice and to try and break the now-instinctive habit of saying just Aeros 51. Then, with a smile, my instructor said “enjoy it – have fun!” and he climbed out. Door closed and locked, there I was, at the edge of the runway, engine on and for the first time ever – alone in the cockpit! I got myself settled in, completed the pre take-off checks and made my first solo radio call: “Student Aeros 51, ready for departure”. My heartbeat had calmed and it felt like any other circuit. After waiting for a while, I received clearance to take-off and I took off the brakes and started rolling on to the runway. It was only at that point that it truly sank in. 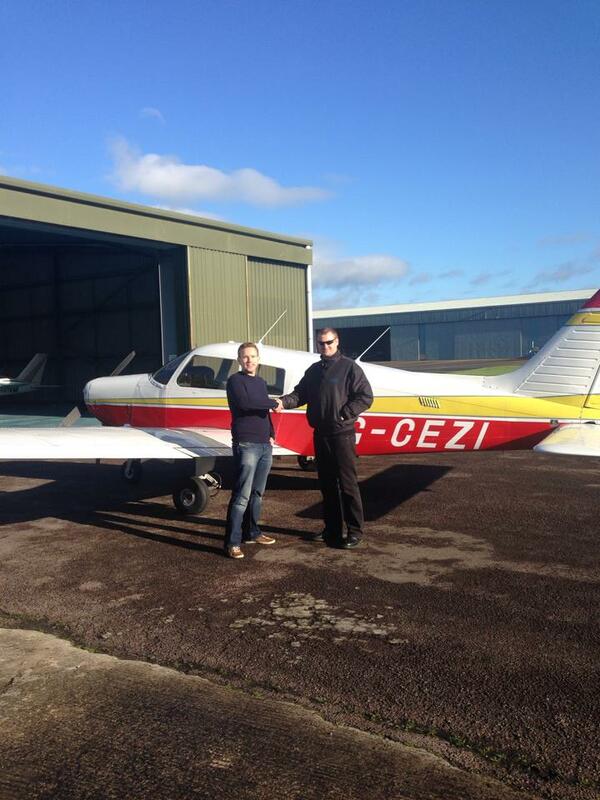 I was about to take off, fly around the airfield and land again – on my own. Entirely alone. Nobody for advice, nobody to takeover in the event of me messing something up. It was all down to me. Full throttle, final take off checks, and pull back. I am in the air – flying – alone. From this point onwards, my mind entered a kind of “auto pilot” mode and I was reliving – almost subconsciously – the steps we’d been rehearsing in all the circuit practice lessons I’d had. My memory is a blur of what actually happened during the flight, so I’m grateful for the GoPro, which captured the whole thing. Everything seemed to go smoothly and I made a safe landing. I touched down a little later than normal and took a second or two before applying the brakes, which meant that I was quite a bit faster than we’d normally be when turning to the left to exit via runway 18/16. I started to turn left (left rudder) and soon realised we were moving too fast to be able to safely take the exit, so straightened up and headed down towards the end of the runway. Runway vacated, I taxyed back to the Aeros apron via a holding point whilst a vintage plane took off from the grass 22 runway. Back in the apron, power-down checks complete and the engine off. Headphones off. Deep breath. I was shaking. After a high-five from my instructor, we posed by the plane for the obligatory ‘congratulations’ photo, then headed back inside for a coffee and debrief. I’m writing this post the day after my solo, yet I still have a huge grin on my face from yesterday. I keep telling myself that I have flown a plane – alone – but it hasn’t yet sunk in… The excitement – and sense of achievement – from that first solo is massive, and it re-enforced (not that it ever needed to!) my decision to finally learn to fly. It’s given me a taster of what’ll be possible when I get my licence. I realise I’m still at the very beginning of a very long (never ending) journey of learning, which will continue long after obtaining my PPL. Bring it on. 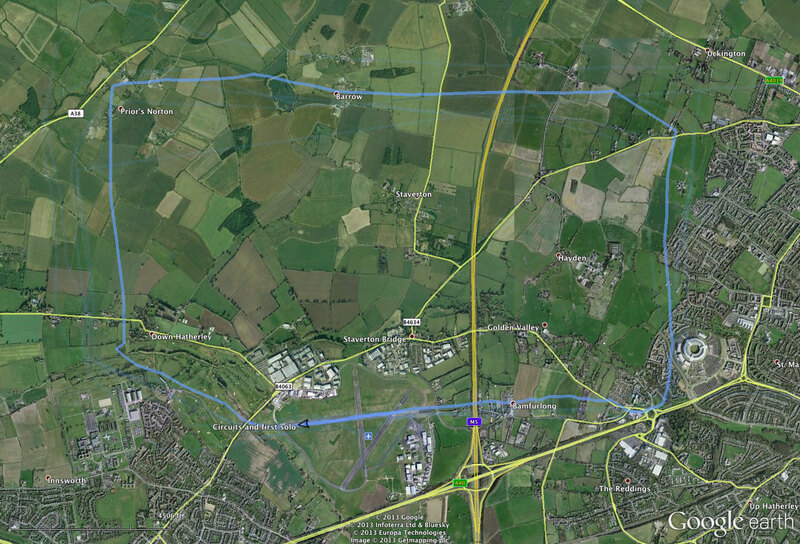 My GPS track isn’t geometrically perfect, but it’s not bad – and hey, it was my first ever solo after all! The next five lessons will be ‘consolidation circuits’, wherein we have a mixture of dual and solo circuits. Hopefully this will build confidence a little more and make the whole experience seem a bit more normal and, hopefully, shake-free! Just watching your video has filled me with a lot of confidence, especially with my solo coming up in the spring. Due to the bad weather my lessons have been few and far between, you’ve done a great job thanks for sharing your experience. By this time I’m pretty sure you have your PPL by now or will be on track to achieving it. Wish you the best of luck hope we can stay in touch maybe you can teach me a few things.